Newsarama: Cullen, let's talk about the recently unveiled Mania, a new symbiote-powered character who looks like she's going to be a sidekick to Venom. 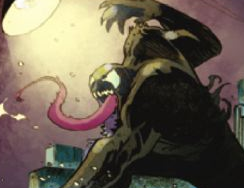 There have already been guesses as to the identity of the character, and I was curious about what motivated you to expand the symbiote world further, and however much you want to share at this point about the character? Cullen Bunn: Mania is a character I've had in mind for a long while. 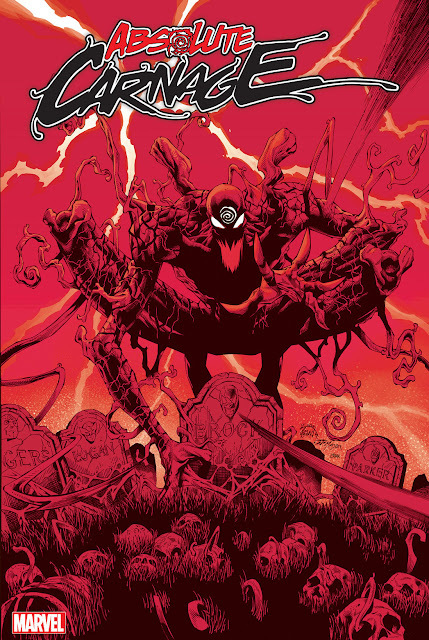 Not necessarily since I took over Venom from Rick [Remender], but I had a notion even back then about introducing a new symbiote-enhanced character into the Venom universe. As I started working on the series, and especially once we decided to take Venom and move him to Philadelphia and I knew that I would be expanding his cast anyway, that's when Mania came into my mind, and I realized what I wanted to do with her as a character. There has been a lot of speculation as to who the character is. There's been a lot of speculation as to, "Will she be a temporary character?" But my intent is that she will be a permanent addition to the Marvel Universe. She will play a huge role in the next several issues of Venom; she has a big part to play with resolving some storylines for Flash. And yet she puts Flash Thompson in a new role, because he will be taking a lot of responsibility for her arrival into the Marvel Universe. Nrama: It definitely seems like a different dynamic for the character — Flash being in the role of superhero is still pretty new, so for him to be the senior partner in the equation has to be different thing for him. Bunn: It is. It's going to be a little unsettling for Flash. And one of the reasons is, as you know, Flash has always been almost at odds with the symbiote. It's always caused him a little bit of frustration and headaches, in that his bond with the symbiote has almost been antagonistic at some points. That's one of the things that we'll find with Mania is a completely different story. She'll find it much easier to relate to her symbiote, and to bond with that symbiote, than Flash ever did. Nrama: Over the years, Marvel has introduced various symbiote characters, and though some have obviously succeeded more than others, to this day, there are fans out there who really like all of that stuff, and want more added to that mythology. Have you gotten a lot of feedback from those types of fans? Bunn: Yes. As soon as I took over from Rick, who went to great lengths to kill off most of the other symbiote characters. As soon as the fans heard that someone else was taking over, I started getting the requests to bring back other symbiotes, and incorporate other symbiote characters who have appeared into the book. Hybrid, and Scream and Scorn — Scorn is the one everybody wants me to do something with. If I was going to undo Rick Remender's good work, and if I was going to bring someone new in, I wanted it to be character I had a hand in creating. I wanted it to be someone that had my stamp on it. That's why I went with someone completely new. It's not that I have anything against those other symbiote characters, but the ones that Rick showed being killed by Eddie [Brock], I have no plans to undo their deaths. Bringing this character into the book the way I'm doing makes sense for Flash. It works for Flash, and it impacts his character in a big way. If I just had Scorn show up, it wouldn't have had the gravitas that it would have with the way I'm going to introduce Mania. Nrama: It seems like another evolution in making the book your own — Venom has been around for decades and, separately, Flash Thompson even longer, and you came into this series after it had already been established, but since then you've moved Flash to Philadelphia, you're debuted new characters, and now bringing in a new symbiote character feels like another example of you putting your own stamp on the book. Bunn: Yeah, that's one of the things I wanted to do with it. I wanted to keep playing with expectations, and escalating stories in ways people are not expecting, and this seemed like the right time to do it. The storyline in which she appears — the solicit is for issue #40, but Mania does appear before issue #40 — is a lot of fun, and I think it's a little bit of a different story than people are expecting. I think her origin will surprise a number of people. Nrama: Which artist designed Mania? Bunn: That was Declan Shalvey. He's been doing the covers. Declan and I had been talking about introducing the new symbiote character for a while, before we knew he was going to be moving off the book. It was nice that even though he is moving on to other products, he's still able to be involved with something that we've been talking about for a while. How do you feel about Mania becoming a permanent addition to the Marvel U?